This free to play city building MMO takes you to the exciting lands of ancient Greece during the assault of Xerxes and his invading Persian army were players are in charge of a city state and must successfully manage their own resources, personal army and the expansion of their territory. Players have the ability to work cooperatively with each other and create allied Coalitions or they can simply negotiate and trade with other cities and use diplomacy to get ahead or raise the war banners and march on their rivals to raise their cities and claim their territories for themselves. Sparta: War of Empires is a browser-based free to play MMO that players can access quickly through their own web browser without the need of downloading any client. During the fifth century BC the powerful ruler Xerxes had unleashed his army upon ancient Greece with the intent to destroy and conquer the land and claim it as his own, never before had the Greeks seen and assembled force of such magnitude. Under the command of King Leonidas and his Spartan armies the various Archon have been rallied with the intent of destroying the Persians who now sweep across their homelands toppling city after city and leaving devastation and bloodshed in their wake. At its base level the foundations of the game are built upon resource management and the ability to acquire new resources and moderate how they are used up as players spend them to advance their city, build an army and make trade agreements. When a player has built up a strong enough city state they may look to joining a Coalition to play some of the endgame content consisting of large Coalition vs Coalition battles and more aggressive fights against the Persian AI. The game is very conflict focused, with both PVE but more commonly PVP against other player city states; at some point all players will have to engage in PVP whether it is by their choice or of an attacking player and many have the ultimate goal of reaching the top of the game’s leaderboard to earn extra rewards. The game revolves around the use and acquisition of three main resources: grain, timber and bronze, which are used in practically every area of the game and most of the features revolve around using or losing these resources. 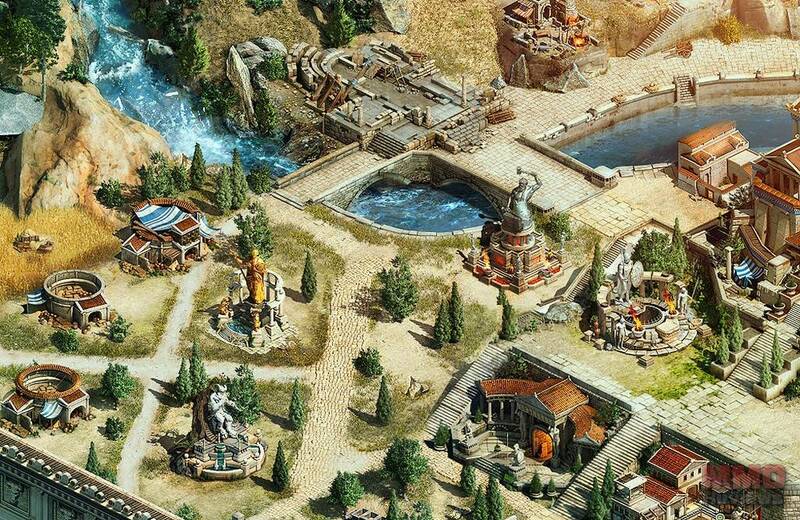 Acquisition can be done in a variety of different ways, from building production focused buildings in your city such as farms, forges and lumber yards, completing quests and tasks and gaining them as rewards, taking control of different Colonies which will earn the player one or more resources each day that they control the or even trading with other players. Finally players are able to take their armies and lay siege to a rival city state to try and claim their resources through PVP. PvP typically occurs when a player tries to lay siege to gain another players city or a Colony that they have currently occupied with their own troops, when this happens the computer resolves combat automatically determined by the number of troops in the attacking army versus the number of troops that are defending and the combination of different units in each army. Some players wish to take over as many locations as possible and spread their borders, where others are focused more on accruing Siege Points so that they can earn special resources each week. Finally players can fight each other in Coalition V Coalition battles and fight over the various Pantheon areas, which focuses around more endgame content.